Travelling back in time is something that no doubt many of us have wished for. Former Swansea journalist and latterly publisher David Roberts has been doing just that for the past 21 years and in doing so has taken us all on a fantastic trip down Memory Lane – allowing us to visit long forgot-ten faces and places as we go. David has produced a wonderful series of annual pictorial nostalgia books that have given us the next best thing to a Swansea family album and this year marks the coming of age with the publication shortly of his 21st book which is soon to hit the shelves. Swansea –The time of our lives promises to be yet another unique peep back at Swansea on its journey through history. It is again crammed with images of people, places, events and more. The picture here is just one of many delightful snapshots in time contained within the book’s 192 pages. It shows pupils of Mayhill Junior School in the mid-1950s, proudly showing off the magnificent display of produce they had gathered for their annual Harvest festival service. At this time of year it is certainly a topical subject. For details on how to buy a copy of the book contact Bryngold Books on www.bryngoldbooks.com or phone 01639 643961. 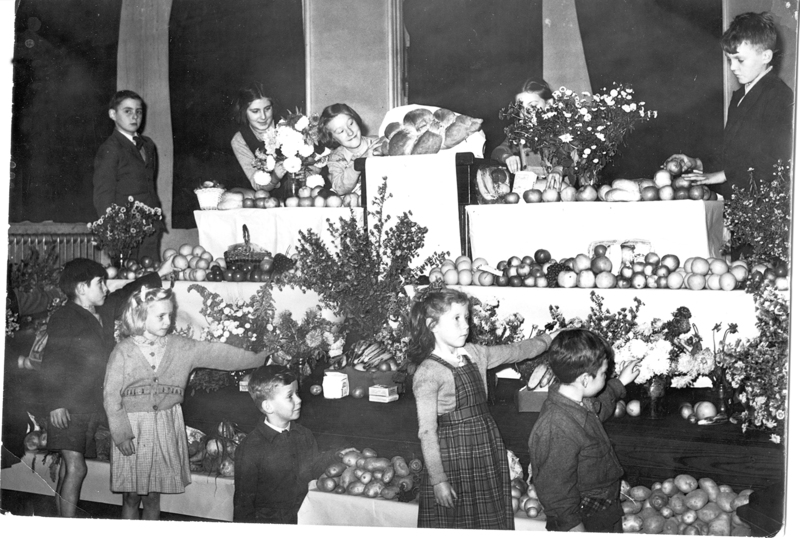 Pic above right: Pupils at Mayhill Junior School with their Harvest Festival display, mid-1950s. The school has since been renamed Seaview Primary. Are you an unpaid carer looking after a family member? Why not join this Free group harmony singing choir? The Swansea Carers Choir is made up of carers and ex-carers who find this kind of music therapy a welcome relief and a stress buster. They meet on Thursdays from 11.30 to 13.30 during term time at the Swansea Wellbeing Centre in Walter Road on the corner of Burman Street, Swansea SA1 5PQ. No experience is needed and it is suitable for everyone – even if you don’t think you can sing! They also have a Facebook Page where you can find out more. 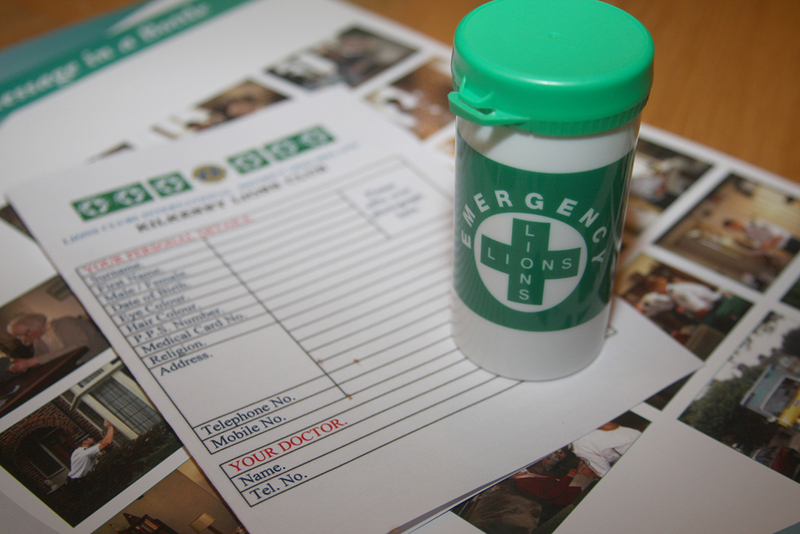 The Lions Message in a Bottle scheme is a simple idea designed to encourage people to keep their personal and medical details on a standard form and in a common location – the fridge. Whilst it is focused on the more vulnerable people in our community, anyone can have an accident at home, so this scheme can benefit anyone, including you. As the name suggests, the personal information is kept in a small plastic bottle. The bottle has a push-fit lid and is big enough to hold the necessary information. The bottle is then kept in the fridge, where the emergency services will expect to look for it in the event of being called to your home. They will be alerted to your membership of the scheme by two ‘green cross’ labels. One is fixed to the back of the front door (or the door most used to access the premises), the second is attached to the door of the fridge. Your health centre, doctor’s surgery and chemists will all have supplies of the bottles and forms. They will also be available in some other venues like the community centre or your local church. The information you need to provide is quite straightforward, but you may like to ask a relative, neighbour or carer to help you complete the form. Are you a Carer? If so, for whom and where do they live? In addition, we strongly recommend that you also include your repeat prescription list. This is produced every time a repeat prescription is ordered, and this information is of great value to the ambulance service. Paramedics are able to administer drugs, but need to know of any you are already taking to eliminate the risk of drug interaction. The Gwalia Singers, a Swansea-based Male Voice Choir, has accepted an invitation to take part in the annual Celtic Festival in Barbados in May 2019. Plans are being made amidst great excitement for the members and those who will accompany them. The choir was founded back in 1966 with only 14 members and it has grown significantly to be able to call on well over 60 current choristers, although not all can attend every concert. It is encouraging to note that membership continues to grow, thus bucking the general trend of choirs finding it difficult to recruit new people. Quality of performance and enjoyment clearly counts. Many invitations come from other countries –a tour to Italy last year, and a performance in Germany at the end of last month. However, the invitation to sing at the Celtic Festival in Barbados is a real feather in the cap as was the visit to a rehearsal by the Barbadian High Com-missioner. It is hoped that some local organisations would like to be associated with this success and help to sponsor the trip, with advertising, shirt logos and many other opportunities. Naturally, the Gwalia Singers continue to welcome new members who love to sing. Rehearsals are at the Linden Christian Centre, West Cross. If you want further details about joining, or about how you can become involved with this project, please call the Secretary, Alan Clewett, on 01792 203392. Sketty Market is back with a new approach and new stalls including vegetables, Carmarthen butter, bottled milk, free range/organic eggs, jams and pickles, vegan produce, a variety of bread, a selection of pies, local prize winning honey, plants, patisserie, fudge and chocolates, local art and craft. Coffee and biscuit is available for 50p. The market is held every 1st Saturday of the month from 9.30 to 12.30 at the Parish Church Hall. Plenty of free parking.